MARP members and community friends have a special treat in store when our regular monthly meeting convenes on March 9 in the restored Grand Trunk Railroad Depot in St. Johns. 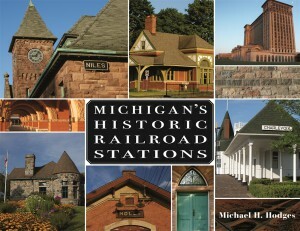 Michael H. Hodges, author of the recently published Michigan’s Historic Railroad Stations, is scheduled to take us on a historical and architectural tour of 31 of our state’s most interesting and picturesque railroad stations. Mr. Hodges, who is the fine arts writer for the Detroit News, traces his fascination with architecture to his years as a student at the Cranbrook School. He became intrigued with railroad stations while working on a story about a homeless man living in Detroit’s abandoned Michigan Central Station. Following his talk, Mr. Hodges has graciously offered to sign copies of the book purchased at the meeting or brought with you. The building in which our meeting takes place, the former Grand Trunk Railroad Depot, has its own interesting history which we will hear more about from Jenny and Gary McCampbell, volunteer managers of the Clinton Northern Railroad Museum which occupies the building. Jenny and Gary are on a mission to instill an appreciation of the rich history of railroading in the area. On display at the station is a 1903 RPO car, which now receives children’s letters to Santa each Christmas. In the early stages of restoration is a 1902 Smith & Barney Sleeper car whose journey here is another interesting story that the McCampbells may tell us more about. If you are interested in ride-sharing to the meeting, please reply to this email. We will put you in touch with others in your area.